The moment of truth has arrived with a force noticeably stronger than a tornado blowing across the land. This ugly truth is not from God but the enemy who deceives the world. The world around you tells you that God is dead. It says that following Him is what sets you apart as different. The life you've chosen to live for Him and the calling He has given you is wrong. It will not lead you to anything but loneliness. Yet that is the truth the enemy wants you to believe. He twists your mind into thinking you are really alone, strange, and not good enough. He feeds lies to deceive you into believing the line of naysayers along the way. Nonetheless, God is calling YOU to rise. 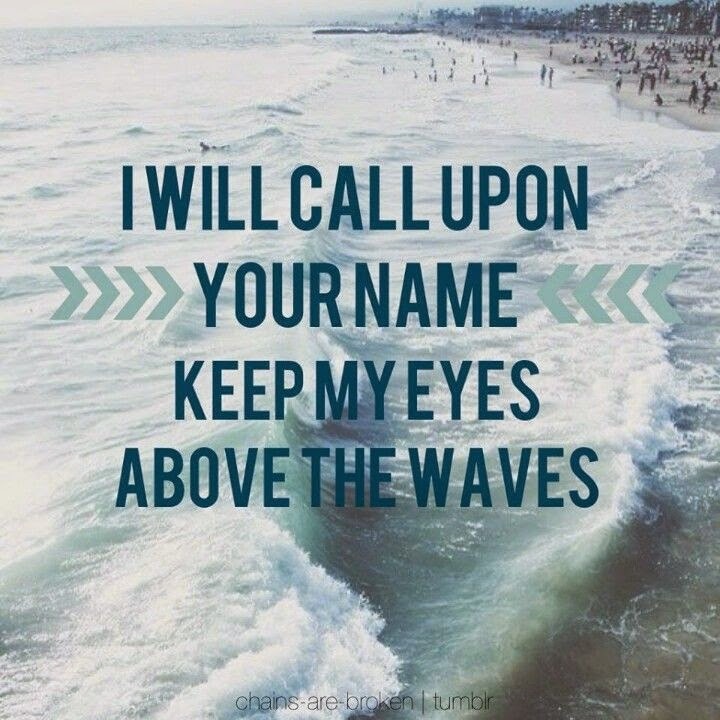 He is calling your name. He whispers into your ear words to show you He is there. All you have to do is listen closely. 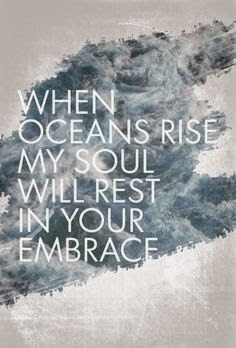 Rise up and meet Him where He needs you to be. You don't have to be a Queen of a Castle to fulfill what He is calling you to do. You don't have to be the wealthiest or best educated. You don't have to have a long list of credentials either. You just have to be brave enough to walk the waters to Him, beyond what the enemy says along the way. Nehemiah was a cupbearer, the lowest of the servant chain, testing the King's drinks for poison. He could have died in an instant with one taste. He still went out to help rebuild the Jerusalem wall. He was criticized the entire time by both enemies and those closest to Him. However, he still completed it. Not only did he hear God's voice calling him, but he finished the task given to him. He did not give in and quit. How about you? What is God calling you to do? Will you put one foot in front of the other as you cross the ocean to Jesus? What or who is stopping you along the way? *Do you like to write? Do you have a blog? Perfect! Come join the party on Fridays at www.katemotaung.com . For years, I was a follower. I followed peers in making decisions to use controlled substances in high school. I followed unhappy people when I started developing a negative attitude. I followed those who told me if I was like X, Y, and Z, then I would be a perfect Christian. I followed the opinions of others towards me as a reflection of being strange, weird, or not good enough. Sometimes, I followed the world when I felt I had to be over-glamorous with my appearance or needed to look a certain way to gain applause. I thought that if I looked and acted a certain way, even if it meant drawing attention to my body through immodest clothing or by wearing a self-righteous attitude, I would feel better about myself. In hindsight, I didn't. The applause lasted for a moment and then I was back to where I felt before I did what I did to get the attention. I've been reading Donald Miller's latest book, Scary Close. He talks about how he attended a seminar called Onsite to help improve his relationships. What he came away from it was that often times, we cover our real self with things like humor, attitude, or other mechanisms that draw attention to us as a way to receive love. He said that shame can cause us to hide our real self. Somewhere along the way, we felt like we didn't measure up. Therefore, to hide the shame of our real self, we create a character that we think others will like as our new "appeared" self. Miller says, "The root systems of these lies we tell ourselves tend to grow together. It's all connected with the belief human love is conditional. But human love isn't conditional. No love is conditional. If love is conditional, it's just some sort of manipulation masquerading as love." As a teenager, I was bullied pretty badly. I longed to be loved and so I craved it by cutting my arms. When I slashed my wrists, I never felt the pain. The only pain I felt was the need to feel loved. I didn't realize that I was loved. I didn't quite capture the love God had given me already through the sacrifice of His son. I used to spend a lot of time using social media. I loved being able to connect with others. But let's be honest. A lot of it is about getting some attention for the things we post. Have you ever posted something not to get any "likes" and started wondering if the problem is you not being liked? To me, that's what a lot of it appears to be. And a lot of it appears to be a mechanism to show our appeared self as perfect. We only post pictures of us when they look just right. We share our most intimate moments to gain satisfaction and applause from others. Today's world longs to have that feeling of love. To really understand, just look around at some of the biggest celebrities. They'll do what it takes to gain attention whether being inappropriate on stage or taking drugs. But deep down, what they long for is to be loved. Donald Miller says it perfectly when he says, "Nobody steps onto a stage and gets a standing ovation for being human. That's the difference between being loved and making people clap, though. Love can't be earned, it can only be given. And it can only be exchanged by people who are completely true with each other." Finally, I gave it all up. I gave up social media stuff. I gave up trying to cave into the pressure of doing what I could so I could have a moment where I felt as though I was liked. I realized I didn't need the opinions of man to decide whether I was good enough. God already thinks I am. What I've learned more over time is that I needed to be authentic. I needed to remember that I was made in God's image and by HIS grace, I've been saved. I needed to realize that not everyone will like the real me. And that's okay. God loves me and He sees my heart. So I've learned to throw a lot of the lies I had bought into away. I've learned to live a more authentic life, being willing to share my mistakes with others. I've learned that it's okay to try and NOT be perfect. Instead, I can be real and relatable. Since then, I've become more confident. I feel like I can radiate the Gospel story to others through my authenticity. And instead of following what is okay with the world, I choose to follow Jesus instead, giving my all to Him. ***Do you enjoy writing? Do you have a blog? Come join the party. Every Friday, you are given a word/topic to write about on your blog. 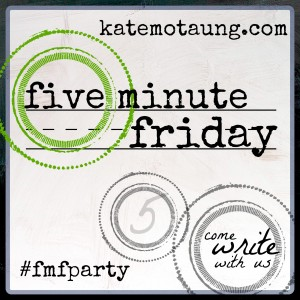 Spend five minutes (or in my case more), and link up your blog at www.katemotaung.com. How often can you say you've experienced a moment of fear and thrill where they meet in the middle? And yet, you sense God's presence there as well? When all those emotions collide, you get a strange sensation of incredibleness as you stand there in view of the amazing wonders of creation. Right about now, you are probably wondering what I am even talking about above. Last Saturday, our town experienced a tornado. We had several days of severe weather and we had already spent time in the storm closets. As Saturday approached, it was predicted that we may have some storms roll through but no mention of a tornado. I have a whale of a fascination for weather and it's easily noticed by people close to me. I am pretty sure that I could easily get involved in some sort of weather job in the future and really enjoy it. Since living in Texas, I get a thrill over watching the storms that come through. Anything having to do with observing creation is pretty neat. Before the tornado hit, I was watching a website that shows the storm chasers in our area with live streaming. It was pretty cool seeing one right up the road from us. As we watched his streaming, he was pointing out that there was something in the midst. At that time, the news channel warned the people of our town to take cover as a tornado had been spotted. I looked outside and all of our neighbors were standing there looking in the sky. Since we had to travel to the neighbor's storm shelter, as we headed over, we could see what they saw. A funnel cloud headed our way near our neighborhood. The sirens were blasting and people were beginning to get into place. Ironically, we watched it as it was passing by on our way to shelter. I caught it on camera and it was that moment described above. I felt fearful for what was so close and could be so damaging. I felt thrill for seeing something that most people see from TV. I felt God's presence as I thought about how amazing all of the different parts of weather is that He creates daily. It was really neat to say I could scratch that off this fascinated weather gal's bucket list. I can't even begin to imagine what it must have been like to experience the Red Sea parting or the whole earth flooding from the view of an ark. I can't imagine what it was like to have been Lot knowing a whole city was being destroyed right behind him. I can't imagine what it must have been to see that storm when Jesus began walking on water. All that happens in regards to weather, the birds, the animals, and the miracles are all amazing. It can be fascinating beyond words when we take the time to really look around and see all that He has made. We need to spend less time absorbed with ourselves/technology, and focus more on what happens around us each day. Get outside and watch the clouds pass by. Notice their shapes and sizes. See how many butterflies and birds you can find in the springtime. Admire each snowflake that falls while trying to catch a few on your tongue. Gather different colors of leaves together in the Fall and compare them. Go on a nature walk to see how many animals you can find. There is so much to see that we often forget about when we are absorbed in everyday life. It's a beautiful world. I had a set of grandparents that both passed away in the last four years. Amazingly, they were married for well over 60 years. Together, they were a couple who were deeply in love all the way through their 90's. As they aged beautifully together, they continued to compliment each other so well with a deep set of love in each other's eyes only for each other. When they went out to the store, my grandfather would rush over to my grandmother's door, opening it for her and putting her arm around his as they walked to the entrance. He wanted to be sure she wouldn't fall as they both became so fragile. They attended church each week and were eager to hear the message God had for them. And they prayed for each of their family members while lovingly guiding us with their wisdom they've learned along the way. In their younger years, they would dance together to the Fred Astaire and Ginger Rogers song, "Cheek to Cheek." After my grandmother died, my grandfather still talked about the times they would dance to this song. They were an example of a Godly marriage. They loved the Lord and they loved each other. They were strong believers with traditional values and yet, they were incredibly kind to others. Now that they are in Heaven, I often think of them and the future. I think of when we will meet again. There will be no more sadness, pain, or tears. Instead, we will be together rejoicing in the arms of our wonderful Savior. I am so thankful for my upbringing and the people along the way who have pointed me towards the cross. I am thankful for the reunions we will all have together in a place so unbelievably amazing. Until then, let us bring the light of Jesus to this often terrifying world. Let us be His humble servants as we dream about dancing with our Savior cheek to cheek. And when that moment comes, we will find that happiness we seek. A couple of nights ago, we turned on the news. The entire news coverage was on the Baltimore rioting. People were burning down buildings. Cars were driven in the direction of the police, swirled around, and the driven through fire. This city was being burned by those who were angry. The next morning, I read two stories. One story was about Bruce Jenner. Another was about the hatred a bakery has received because they refused to make a cake for a lesbian wedding. And presently at the moment, the Supreme Court is deciding on what the definition of marriage should be for our nation. People call this the next Civil Right's Movement. Friends, it's becoming increasingly harder to be a Christian during these times. People are becoming lovers of money, lovers of themselves, filled with more hatred, more envy, and treating each other with unkindness. When you stand at the doors leading to different paths, knock firmly on the door leading to the Truth. Don't be fooled by the ways of the world. Devote yourself to prayer. Commit your ways to God. You are needed to share God's love to an angry, messed up world. Your neighbors need you. Your community needs you. And God needs you to go and bring others to Him.